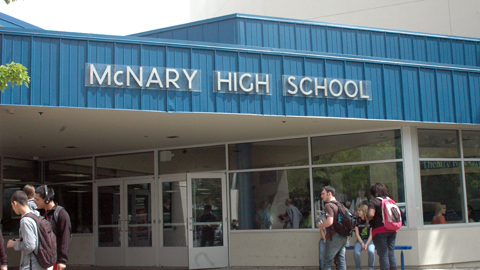 Of McNary High School’s more than 2,000 students, only 28 or less than 1.4 percent are considered dropouts. But for principal Erik Jespersen and assistant principal Rhonda Rhodes, that is 28 too many. Beginning in February, McNary will be the first high school in the Salem-Keizer school district to offer a General Educational Development (GED) program on its campus. Currently, there are more kids who are credit deficient in Salem-Keizer schools than seats available at the Downtown Learning Center, the alternative school in Salem with a GED program. MHS will pilot the GED program with 20 credit deficient seniors. The students will meet for two 90-minute periods each day to prepare for the GED tests, which cover reading, writing, math, science and social studies. When students have successfully completed online modules, they will be given a GED practice test. If they pass they will be dropped from McNary, which will then notify the learning center that the student is ready for the test. How long that process takes depends on the student. “It’s all about their individual skills,” Rhodes said. “One kid might have their skills up to speed in all four core areas in one month and another might take the entire semester. The classes will be led by two current McNary teachers, Patricia Farris and William Bond, who previously taught a similar program for 19 years at a junior college in Florida.